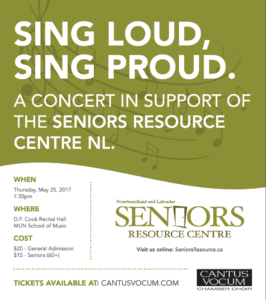 Cantus Vocum is honoured to participate in “Sing Loud, Sing Proud,” a concert in support of the Seniors Resource Centre NL, May 25, 2017, 7:30pm at D.F. Cook Recital Hall in the MUN School of Music. Tickets are $20 general admission and $15 seniors (60+). Please email chad.stride@me.com for details.